Dog kennel cough symptoms (infectious trachea bronchitis) are most often characterized by its most prominent symptom; a harsh, dry out burst sounding cough. Each cough is usually followed with clear vomit and some gagging. Dogs with this condition feel choked in their throat they have the feeling that the wind pipe is blocked. A sign of kennel cough is if coughing occurs when your veterinarian palpitates (gently touches) the wind pipe and a cough occurs. Kennel cough may lead to severe complications such as difficulty breathing, fever, systemic illness, purulent nasal discharge & severe anorexia (an avoidance of food). As they eat dogs feel choked during respiration (breathing). 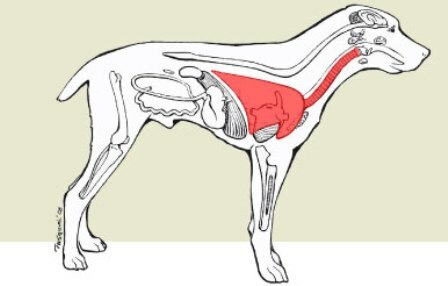 When they ingest food, the swallowing and then food passing through the esophagus exerts pressure on the already congested wind pipe, causing the dog to avoid food. Other symptoms of dog kennel cough include restlessness, appearing emaciated (thin, unhealthy), and a dull coat. The symptom of greatest concern of course is the persistent cough, which initially is dry or non – productive, but may appear as moist or as a productive cough in secondary complications (triggered by other problems in the body). Dog kennel cough is a contagious disease with a high likelihood of spreading to other dogs that come in direct contact with the infected dog. Kennel cough is usually termed as a symptom for a growing respiratory complication in dogs. Dry and persistent cough followed by severe choking and gagging is common. A cough which persists longer then 5 – 6 days should be suspected for kennel cough. Dogs feel anorexia (difficulty in respiration), while the cough makes it very uncomfortable for your dog, making dogs feel restless and lethargic (tired). Canine kennel cough is associated with infections caused by bacteria and viruses such as Bordetella bronchiseptica, adenoviruses, distemper and Para influenza viruses etc. Generalized symptoms include appearing emaciated, fever, loss of appetite and severe weakness. When a puppy is under 6 months of age their immune system is not fully developed. At birth, puppies are born with an inherited immunity from the mother which then is replaced by its' own. As they grow, they lose the immunity they inherited and develop their own. This is why young dogs under age 6 months can contract kennel cough. When a puppy isn't vaccinated, it can get the disease within 1 to 2 days after exposure (incubation). Symptoms are similar to those described above such as a harsh and dry cough. Other symptoms of kennel cough in puppies include tired behavior, appearing exhausted and emaciation (thin, weak, unhealthy appearance). From the repeated coughing and choking, a puppy may vomit. Anorexia is frequent & occurs with every coughing session, leaving the puppy gagging & retching. Moist or productive cough, purulent nasal discharge and severe generalized signs as fever, illness, emaciation & lethargic puppy represents secondary complications associated with infections such as broncho pneumonia (secondary refers to a problem that is the result of a primary problem such as the kennel cough). Clinically, kennel cough can be initiated by gentle palpation (touching) of the trachea or wind pipe. Initially, the temperature and number of white blood cells appears normal. Clinical signs of kennel cough may persist for 5 – 7 days, but the period of disease usually lasts for 10 – 20 days, depending upon treatment, care & management. Symptomatically, dog kennel cough primarily requires control over the cough. The cough can be reduced or controlled by different options such as suppressants and expectorants like codeine, hydrocodone, corticosteroids etc. A natural remedy such as raw honey is very effective as it soothes the respiratory channel up to throat. You can also provide an extra level of support by adding a homeopathic supplement to your dog's regimen such as Pet Alive K-C Defense Formula which contains natural ingredients selected for respiratory care in dogs. They are also a good resource for additional research on kennel cough in dogs care. Broncho Dilators can be of help in broadening the respiratory passage and may be helpful in reducing the cough, which is due to blockage in the bronchus and trachea. This is usually seen in a secondary infection of bordetella especially in puppies. Steroids like morphine can suppress the initial cough, but care should be taken while treating severe infections, where antibiotics are administered.